Like most pro tripod makers, Manfrotto supplies legs and heads separately. Here we're testing the company's affordable 190 Pro B and 460MG three-way head. The leg mechanism is simple and quick to set up, though the flip catches on the leg are quite hard and the third of the three leg sections does look spindly. Nevertheless, at minimum column extension, there's very little twist and flex. At full column extension, there is some wobble, but you'd expect that in any tripod. While the leg mechanism looks simple, it has hidden depths. You can undo a locknut at the base and split it into two, reassembling it as a horizontal boom. The column movement - both vertically and horizontally - is reasonably smooth, but perhaps more importantly it's really quick and simple to operate, using a simple butterfly nut for locking and unlocking the movement. The 460MG three-way head deserves special mention. It's unique in not having pan/tilt handles at all, but locking nuts and an odd curved construction. It takes a little getting used to, but it's extremely flexible, rigid and - for a three-way head - very compact. In fact, the head feels rather better made than the 190 leg set which is, after all, only £90 when bought on its own. If you want real innovation and quality, consider Manfrotto's 458B Neotec quick-action leg set, though at £250 you clearly need to think of this as a long-term investment. 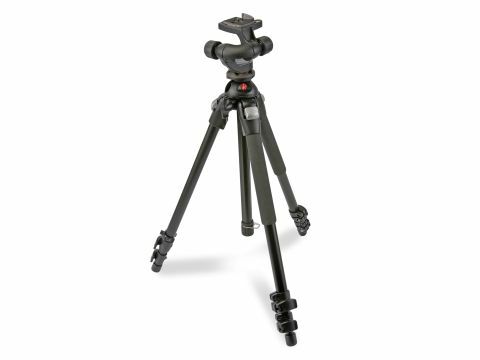 Manfrotto's tripods aren't cheap, but they are good, and the 190B leg set and 460MG head do represent excellent value. However, there are better tripods for your money.